Hendersonville, NC � Perhaps it�s only fitting that a U.S. Open tournament week that was marked by times of torrential rain and localized flooding would be won by a man named Rainey. Weather would interrupt practice week a couple of times and delay the start of the first rounds of the United States ProMiniGolf Association�s (USPMGA) U.S. Open, but once the wet moved out, the �Rain Man� moved in. The Par Tee Time Course at Champions Golf Learning Center is a difficult course, providing few ace opportunities but that didn�t stop Rainey Statum from posting three of the twenty below par (36) scores in the tournament. Rainey, who is a local ambassador for the Major Series of Putting (MSOP) and a member of Team USA, started the tournament with a 114 after the first break, putting him in a tie for 5th place as Danny McCaslin, a past U.S. Open winner, was in the lead at 110. As the course dried out, the scores heated up, as Rainey would post back-t0-back 35 and 34, moving him into the lead after the first day with a 183. 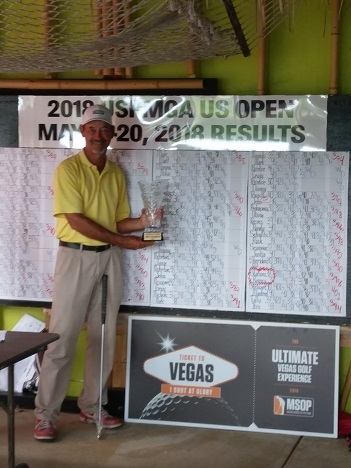 The 34, which was shot by a few other individuals during the tournament, was the course record for a few moments until Randy Reeves, past Master�s champion, posted a 33, a low for the tournament. It looked like Rainey might pull away after day one, with second place being at 187 and belonging to Rick Baird, a member of Team USA, after he shot a pair of 35�s in the afternoon session. However, day two saw the field tighten up during the morning 3 rounds. Rainey would drop a couple of spots, ending the morning at 305 after four straight scores in the 40s. Rick Baird came in at 301 after a solid morning and be rejoined by Danny McCaslin at the top of the leaderboard. Eight rounds also marked the cut line for the tournament as the top 29 (including ties) players moved on to play two final championship rounds. The cut ended up at a score of 319, showing just how close the field was as the top player was only separated from being cut by 18 strokes over the first eight rounds. The pressure mounted in the afternoon as Brian Johnson, another member of Team USA and sitting at 304 after 8 rounds, would make a bid for the win by shooting a 36 to Baird�s 42 and McCaslin�s 38. Statum would shoot a 38 in round 9 but sealed the deal in round 10 by posting his last below par score, a 35. 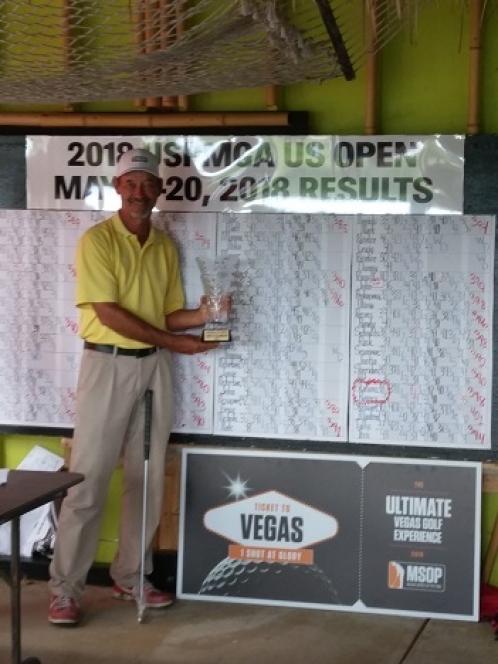 Statum won by just one stroke as local professional John Powell made a move, averaging a 36.25 in the last four rounds to jump into second place. There would end up being a three-way tie for third place between McCaslin and Mike Johnson (another Team USA member) and Gary Hester who both made late charges. After 10 rounds, only 21 strokes separated first place from the last paying place (29th) in the tournament. In addition to the top prize of $2,250 (~1,910 EUR) Rainey also won an entry to the MSOP event in Las Vegas in October. Players in the U.S. Open could purchase a $25 insurance in an attempt to win the free entry or $150 off the entry fee which was paid down to the fourth eligible insurance purchaser. It also seemed fitting that he would win this inaugural partnership having sported MSOP gear throughout the tournament and having won money in the qualifying rounds in Las Vegas at last year�s MSOP. This was Rainey�s first major minigolf tournament win. During his acceptance speech, he would express thanks to the people pulling for him and relief at �getting that monkey off his back�. Bob Detwiler, President of the USPMGA, also remarked that the partnership between the USPMGA and the MSOP would be a benefit for everyone who loved putting and that he saw a great future ahead for the major putting tournaments. The next major USPMGA event is the Master�s on October 11 � 13, 2018 in Myrtle Beach, SC. The 2019 U.S. Open will be held at Mr. Putty�s Fun Park in Tega Cay, SC.